To start off, this post is dedicated to praising a small park in Helsinki that hasn’t received the attention it deserves. This urban oasis is called Lastenlehto Park (Lastenlehdon puisto in Finnish) which has from the late 19th century onwards evolved as a neighborhood recreation space in one form or another to a very central triangular park in the district of Kamppi. What I specifically want to discuss is the outcome of the park’s recent transformation process which possibly has been the park’s most dramatic change in the course of its history. Lastenlehto Park is in the district of Kamppi in central Helsinki. 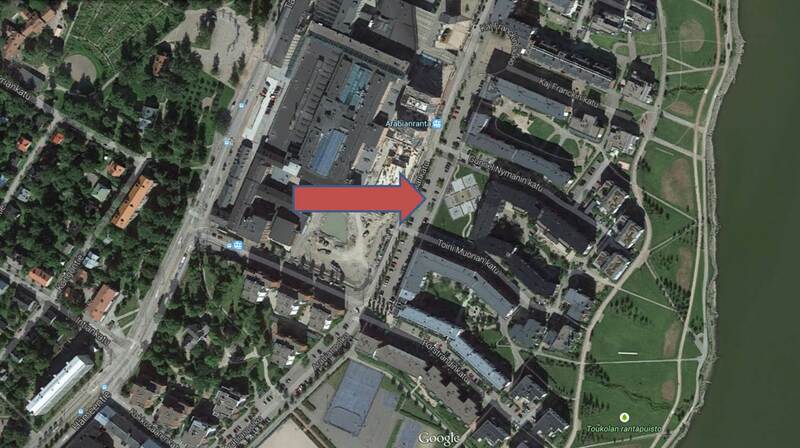 Map: Google Maps. 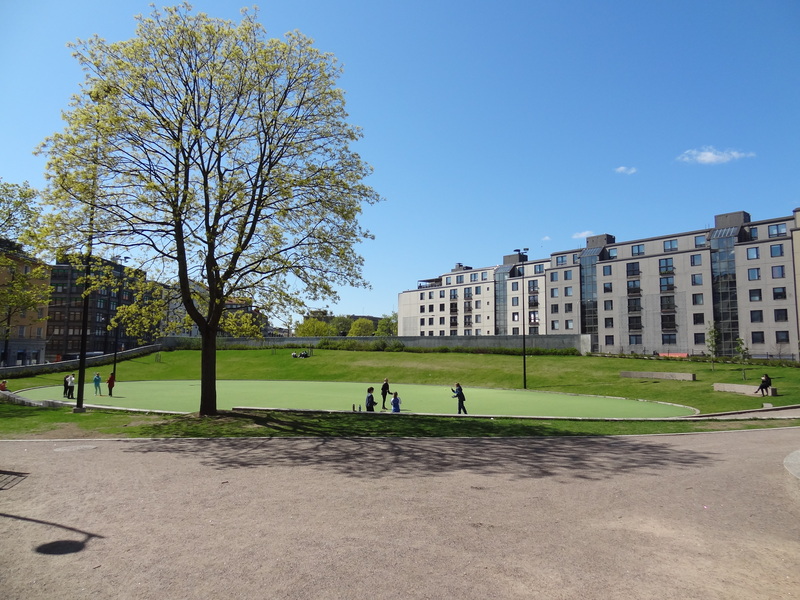 The story is that about ten years ago, the city began to build an underground maintenance tunnel slash parking garage entrance right on the site of Lastenlehto Park to accommodate traffic arriving to the inner city from the West. This meant near to complete annihilation of the park as well as the introduction of an idea competition for eventually rebuilding it after the tunnel would get finished. The design job was ultimately awarded to MA-arkkitehdit. There naturally was a lot of criticism and grief over the park’s destruction at the time, but what came out of the refurbishment project in 2011 is nothing to be sad about. On the contrary, the result is an awesome city park that in my opinion has qualities that should be more often considered when we’re building new neighborhoods in intensifying cities. Firstly, I’m pleased how the project effectively combines two very different urban functions. In this case a ramp to underground facilities and a pleasant park. This idea and successful execution of coexisting functions (without commenting on the functions themselves) is something that we particularly ought to pay more attention to in growing cities. If we continue worshiping the culture of separation so deeply rooted in our urban development practices, we’ll quickly run out of space. 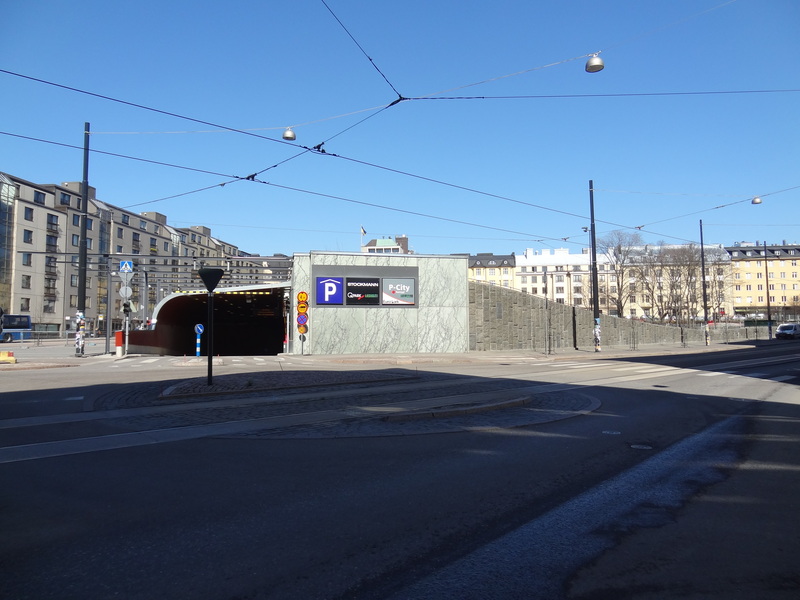 One corner of Lastenlehto Park is on the roof of a maintenance/parking garage tunnel. An evenly important feature is that the character of the park reflects just the kind of urbanist attitude I root for. When we want to make the most out of the scarce land in our intensifying cities we need to revisit the works of notable urban thinkers such as Jane Jacobs and William H. Whyte. This duo and their followers have devoted themselves to observing and studying the key ingredients inviting public places and parks in dense urban contexts are made of. Jane Jacobs noted in her work that great parks have similar qualities as great streets: they should accommodate different users and needs to attract people. Single-use parks have the same effect as single-use streets or urban areas: they’re likely to be empty of people for most of the day. Catering to a mix of uses on the other hand leads to a much broader user base that helps to keep the park alive throughout the day. I find that the designers of Lastenlehto Park have done a splendid job at introducing these thoughts into the triangle-shaped park. In one corner, over the tunnel entrance, there is a bowl-shaped, amphitheater-like grass area that overlooks an artificial turf field which can be used for e.g. different kinds of sports games. Another corner area hosts two fenced playgrounds for small children and a section with a more classic park design which includes a statue and beautiful plantings. The third corner area accommodates a smaller stretch of grass that you can stop to rest on with a little less effort than walking over to the “amphitheater grass”. Paths from the park’s three entrances meet in the middle of the triangle and offer plenty of benches to sit on at the heart of the park. In the summer most of these spots will be in the shade of trees. And finally, the park also has a public toilet. The “amphitheater” corner in the background. The “Arcus tendit Apollo” sculpure by Emil Cedercreutz in the “classic park” corner behind the playgrounds. This corner is the most open and easily approachable. Benches along the main pathway cutting through the park. Summer is naturally the season when parks get used the most in Finland, but I spent a moment on two weekday afternoons in April and May to see what was going on in the park when the weather was not at its warmest and at presumably quiet times (around 2pm when lunch hours are mostly over). My April visit hit a day that was relatively warm. This had attracted young people to soak in the sun because the park is not windy at all like much of Helsinki is especially in the spring. Small children were having fun in the playgrounds with their parents and some people were sitting on the benches enjoying a late lunch. A couple of girls were performing gymnastics on the artificial turf and a bit later on it was taken over by a bunch of boys from the international school. Apparently school was already over for that day and they entertained themselves by shooting each other with a (pretty cool!) arrow-shooting toy gun. The boys were soon followed by a group of girls from the same school who quickly found themselves prime targets for the arrows. During my second visit this month, the weather was much colder. Nevertheless, this time the artificial turf was occupied by a small group of adults and kids who were apparently focusing on the basics of Finnish baseball. Small children and parents were having fun in the playground areas once again, and a group of young adults were sitting on the benches with a crate of beer. Otherwise people of all ages just passed by now and then, and some of them took a moment to linger in different spots near to the pathway. People enjoying a sunny but rather cold May weekday afternoon in Lastenlehto Park. Different groups of people doing different things in Lastenlehto Park. As you’ve probably already guessed, the greatest asset of the park is wherever you sit, you’re always facing some human activity. But furthermore, already this mini test of mine gives some backing to the point that Lastenlehto Park caters for different kinds of users at the same time and that it’s not empty even at supposedly quiet hours of the day and times of the year. This is naturally linked to the fact that the park lies in a dense mixed-use neighborhood. I’m guessing that the park has fair winter usage too as the hill of the “amphitheater” offers great potential for sledging (given there is snow to begin with, of course). For comparison’s sake, as well as for an opportunity to throw some criticism into the mix, I also chose to visit an urban pocket park in Arabianranta, a neighborhood which often gets dubbed as an innovative example of contemporary Finnish urban planning. Tapio Wirkkala Park is located in Arabianranta, a semi-urban new neighborhood just outside of Helsinki’s inner city. Map: Google Maps. My contrasting example is Tapio Wirkkala Park (Tapio Wirkkalan puisto) which is designed by artist and architect Robert Wilson. The park was opened in 2012 as a project for Helsinki’s World Design Capital year. But despite of this, the realization of the park has actually been a decade-long process due to the construction process of the neighborhood and the careful selection of a design worthy enough to commemorate one of Finland’s most renowned designers. In the end Robert Wilson was selected with his artsy idea to transform the site into what he refers to as a “meeting place” for Arabianranta’s residents. On a May weekday afternoon, absolutely no one is using the park. A random sunny July afternoon in 2013. No people in sight. Photo courtesy of raksakamera.fi. From an urbanist point of view the pocket park however is anything but a successful meeting place: I’m yet to see anyone use the park apart from taking a shortcut through it. The space does have art to attract people and it has a central-ish location in the neighborhood next to the redeveloped Arabia factory complex, but that’s really it. There are no other features to make it inviting for people. The core problem is that no matter how you try to look at the park as a person craving to pause for a moment, you can’t imagine yourself stopping to relax there. Where would you even sit? The park doesn’t offer a single bench and the art elements are not stable enough to sit on. Interestingly, there’s a webcam to see what’s happening in the park. Check the archive. More likely than not, you’ll hit a moment with the park being completely void of people. It can be that I just am not the right kind of park user to catch Tapiola Wirkkala Park’s flow, but I’m sure many agree with me when I say it’s not designed for people. And unfortunately, this attitude for designing parks and open urban spaces is all too often present in contemporary Finnish urban development projects. The challenge for Helsinki and other Finnish cities is to make sure that they stay livable as they increasingly get denser and expand. Urban parks and open spaces that lure you to unwind for a moment, or all afternoon, are crucially important for that mission. Lastenlehto Park is a valuable example to begin drawing inspiration from. 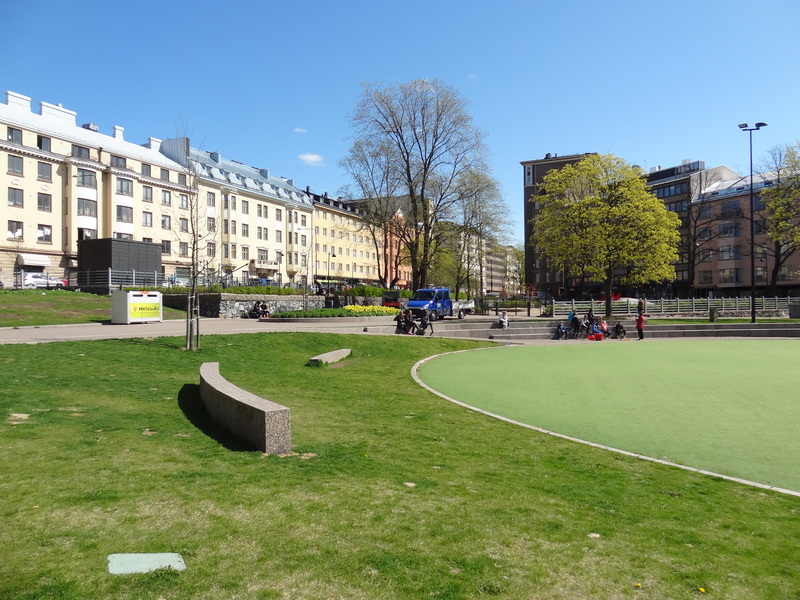 EDIT May 22: Mention of Lastenlehto Park’s designer MA-arkkitehdit was added. Thanks! must go and check it out, not just look at it when driving by. Myself I have noticed how some young urban activists only talk about biking and popup restaurants slash pick nicks when talking about activating or beautifying urban parks and spaces. There really is a lot more needed to make a place or a park attractive. Beauty, by the way, is one of them, definitely. Hey Tarja, you definitely should go visit! And I completely agree, most of the times people are always discussing about events to create buzz someplace. But what’s forgotten is to think what causes them to be often empty altogether. Beauty certainly attracts people. More beauty to the people! About the Tapio Wirkkala park: i walked past it yesterday, two times, and noticed the same thing: there was nobody at all, on a warm and sunny day. Hei Timo, thanks for writing about my favourite park. See you gave it a good William H Whyte investigation too 🙂 I’m guessing you’ve seen “The Social Life of Small Urban Spaces” – good urbanism and humour! Also like the comment to Tapio Wirkkala park …”no matter how you try to look at the park as a person craving to pause for a moment, you can’t imagine yourself stopping to relax there.” Please urban planning professionals in Finland reading this….Please, please take note! You know, it’s funny… Only a day before your posting, I was walking with my friend in Arabianranta’s Tapio Wirkkala Park’s vicinity talking about you. :-) I’m not an urban development connoisseur. 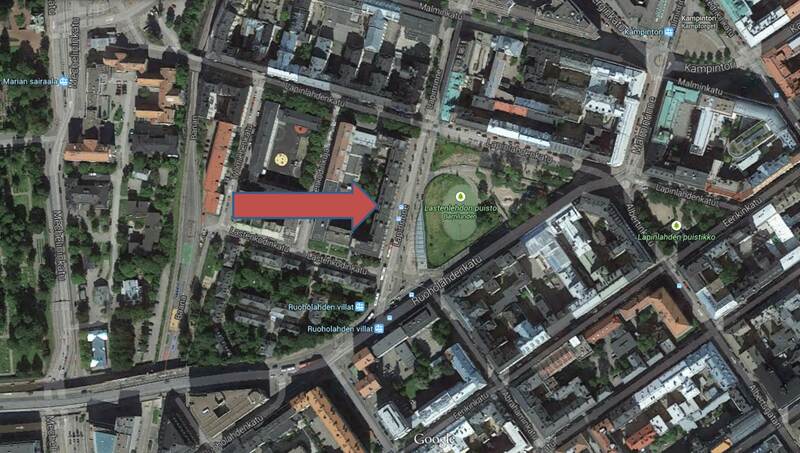 so I was never quite able to put into words what Helsinki’s missing in terms of “city feel”. (told you, I don’t have the vocab) Finland is great and it became my country for many reasons, but something… there was something I felt can be found in other places and not so abundantly here… Once I started reading your blog, you named those things for me and that was great to see! As for Tapio Wirkkala Park, it’s intriguing, interesting. I stopped to give it a thought, to figure out the idea behind the park. It’s cool, but it’s not inviting you in. It prompts you to observe from outside, from the distance.